The gaming world is once again in the grips of PlayStation fever. Crash Bandicoot N. Sane Trilogy was one of this past year’s biggest games, and remakes or remasters of Final Fantasy VII, Resident Evil 2, and (probably) Spyro the Dragon are also in the works. Even some of the lesser-celebrated original PlayStation franchises are being hauled out of storage. 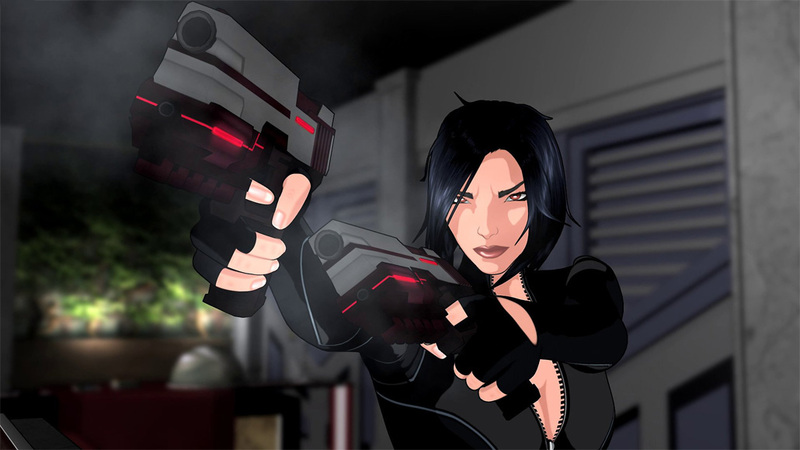 Fear Effect Sedna is a direct sequel, taking place several years after the events of the original games. Sardonic hero Hana, her equally-sassy partner Rain, gruff ‘n’ gritty Glas, and upbeat Aussie psychopath Deke are back and still working as vaguely-defined mercenaries/thieves/principled rogues. This time around, Hana and pals are tasked with stealing an ancient statuette from a Chinese ambassador, but, as always with this series, things end up taking a dark, paranormal turn. Fear Effect Sedna stays true to the tone of the original games, which is to say, it’s exceptionally cheesy. Eye-rolling one-liners abound and the sexual innuendo is troweled on thick. 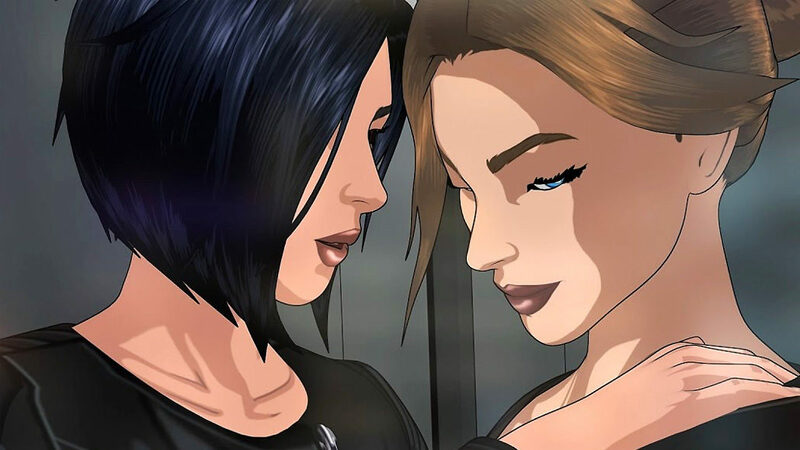 One of the (crassly advertised) selling points of the old Fear Effect games was the implied lesbian relationship between Hana and Rain, and this new game is only marginally more mature about the subject. Yes, Hana and Rain are now explicitly an item — no more wink wink, nudge nudge — but their relationship seems to be perpetually stuck at the awkward flirting stage. Gay women are still a rarity in games, but Fear Effect Sedna is unlikely to win any representation awards for its smirky, leering approach. Admittedly, Fear Effect Sedna does become more compelling once you get to the supernatural meat of the story. Our Scooby Gang end up in Greenland and soon discover a diabolical plot to harness the power of various strange beasts from Inuit legend (which, it turns out, are totally real). Drawing on Inuit mythology is an interesting idea, although some may question using a marginalized people’s stories as fodder for this kind of trashy comic-book-style yarn. That said, the game does toss out a handful of solid twists and turns and presents players with a compelling choice at the end. Once you cut through the cheese, there’s a decent story here. Fear Effect Sedna isn’t going to wow anybody graphically. The original Fear Effect games featured a then-innovative cell-shaded visual style, which this game updates rather poorly. 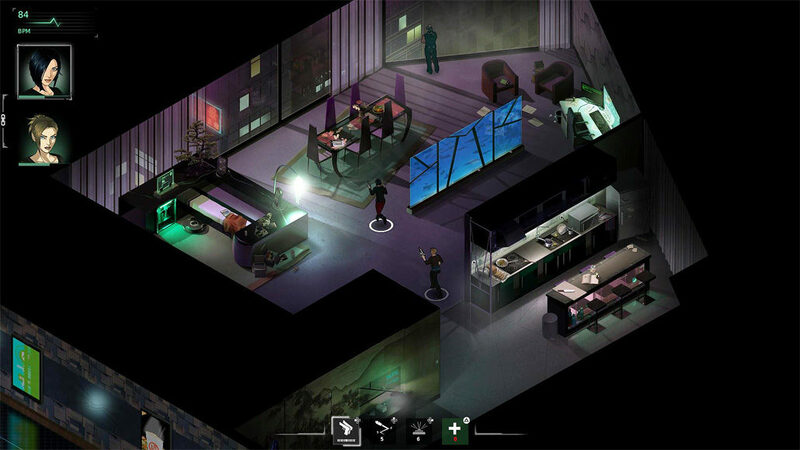 Cutscenes are stiff and awkward, and the isometric visuals used during the game’s playable sections are humdrum. Sedna’s audio isn’t much better – the game’s soundtrack is nondescript, and its voice acting is retro in a bad way. This game doesn’t make a great first impression. As mentioned, Fear Effect Sedna is played entirely in a fixed, isometric view. Depending on the stage, you’ll be in control of up to four characters, each of which can shoot, dodge roll, take cover behind objects, or utilize two limited-use skills (Hana, for instance, can use special “bouncing bullets” and set mines). By pushing the left analog stick, you’ll crouch and enter stealth mode, which makes enemies’ vision cones visible and lets you pull off stealth kills. The mechanics are simple, but they work well enough. 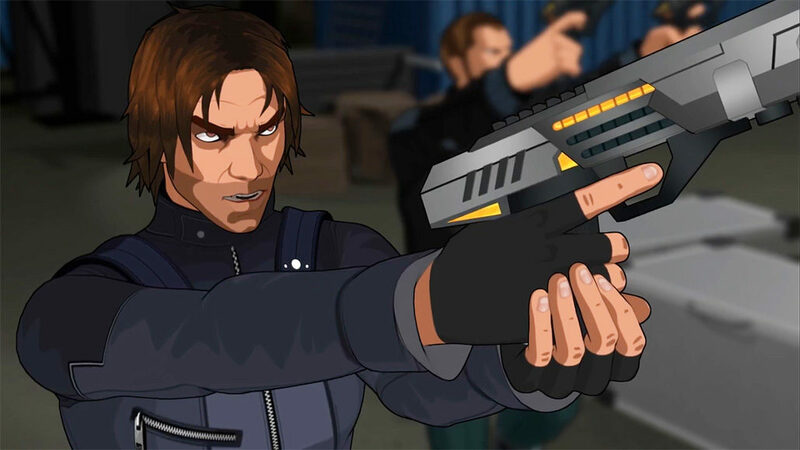 Fear Effect Sedna sells itself as a tactical action game, but don’t expect any real complexity. At any time, you can enter tactical mode, which pauses the action and lets you issue commands to your characters. This is almost entirely useless. For whatever reason, Sedna’s stages are shrouded in a fog of war effect that makes any sort of tactics impossible. You can’t plan for what you can’t see. Enemies certainly aren’t interested in a meticulous game of cat and mouse – if they see you, they immediately swarm you. The only time I bothered to use tactical mode was when I needed to heal or move one of my dumb AI teammates out of the line of fire. Again, Sedna’s basics aren’t bad – shooting, rolling, and the occasional bit of stealth will get you through just fine. Just don’t come in thinking this is a strategy game. The game’s titular Fear Effect isn’t particularly interesting, either. Every character has a health and fear meter – when you take a hit or encounter a particularly nasty beast, your fear meter increases, which boosts the damage you deal and receive. Using a medkit increases your health, but it also lowers your fear. In theory, this creates tension – do you heal, or do you take advantage of your heightened fear to dole out more damage? In reality, it’s almost always better to just heal. Medkits are in plentiful supply and trying to use fear to your advantage usually results in your death, as your health bar depletes quickly. At this point, you may have the impression I really disliked Fear Effect Sedna, but that’s not the case. Sure, the game has its issues, but its level design is surprisingly varied and engaging. 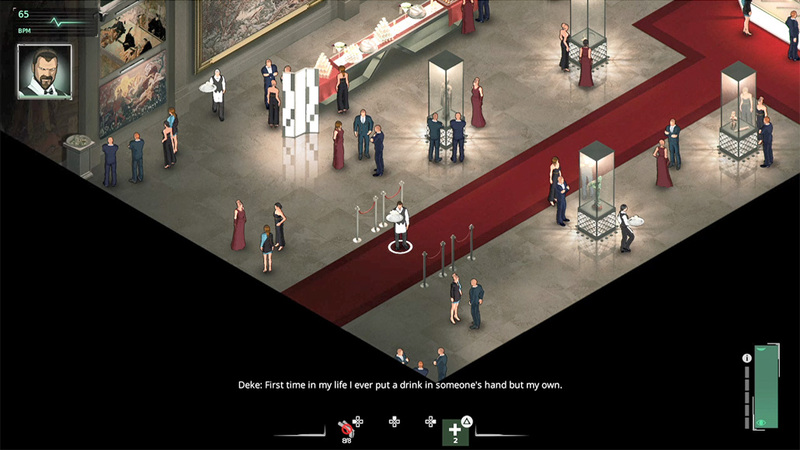 Some of the game’s unique challenges include doing reconnaissance at a fancy dinner party (while making sure the drinks get served), grappling with a fun escape room challenge, and exploring the trippy outer reaches of the Inuit netherworld. There are no copy-pasted stages here – all of them, even the more standard ones, feel unique in some way. Unfortunately, even the better parts of Fear Effect Sedna are often undermined by sloppy mistakes. The game’s clues can be too vague or difficult to spot given the zoomed-out viewpoint (a late-game underwater stage is particularly maddening in that old-school point ‘n’ click adventure game way). Bosses are creative enough, but chipping down their life bar takes far too long. The game is peppered with brainteaser-style puzzles, which are typically fairly clever, but most of them punish failure with an instant and elaborate death. These gory Game Over scenes were part of the original Fear Effect games, but the nostalgia wears thin when you have to watch your character get splattered a dozen times because you keep pushing the wrong buttons in a poorly-explained puzzle. Fear Effect Sedna clocks in at around seven or eight hours, and there is some incentive to play through again (hidden items, an alternate ending). Most probably won’t bother. “What will this game throw at me next?” is Sedna’s main appeal – once you know that, the game’s flaws become more apparent. This review was based on a PS4 copy of Fear Effect Sedna provided by publisher Square Enix. Fear Effect Sedna is proof creativity can’t always overcome poor execution. The game is often quite enjoyable, but the inspired moments can be difficult to appreciate amidst Sedna’s mishandled nostalgia, ill-considered mechanics, and sometimes-wonky level design. Those willing to ride out the rough patches (or just hungry from some early-2000s cheese) may want to give the game a try, but I’m afraid I don’t see this being the Fear Effect franchise’s big comeback.